Percy Sims was born in Yeovil in 1898, the youngest of the six children of coal merchant's carter John William Sims (1853-1933) and Susan (née Mann?) (b1852). John and Susan had a total of eleven children but five died in infancy. The surviving children were Frank (b1882), Ernest Thomas (b1885), Elsie (b1887), William (b1889), Rose (b1895) and Percy (1898-1917). Other than Frank (who was born in Newport, Wales) all the children were born in Yeovil. 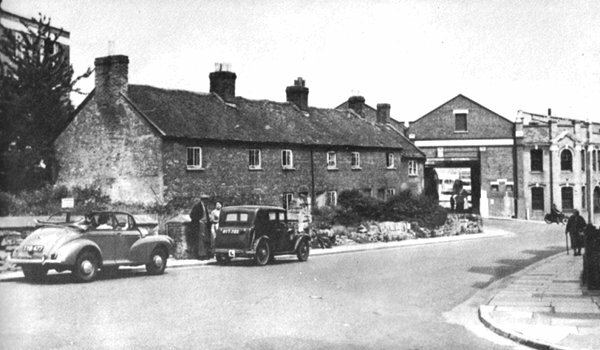 The family had lived in Sparrow Lane before Percy was born, but he was born in Queen Street. By 1901 the family were living at 9 Reckleford Hill, between Mary Street and Goldcroft (see Gallery). By 1911 the family had moved to 120 Park Street. John was now a travelling salesman and Percy was still at school. 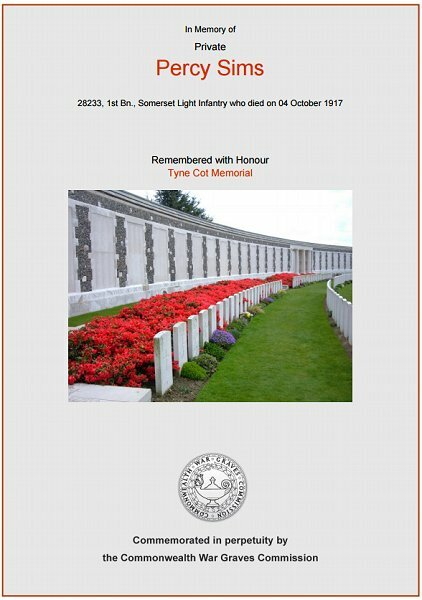 Percy enlisted at Yeovil, joining the 1st Battalion, Somerset Light Infantry. Assuming he didn't enlist under age, he would have enlisted in late 1916 but his Service Number 28233 suggests it would more likely have been during early 1917. Field Marshal Sir Douglas Haig thought that Flanders presented a much more attractive target than the Somme as it was close to the main British sources of supply, was familiar to his staff and offered the chance of a breakthrough with targets such as the German railhead at Roulers and the Channel ports from which German submarines were conducting operations (he was under pressure from the Admiralty to clear the Flanders coast). The attack was preceded by the assault of Plumer's Second Army on Messines on 7 June 1917 with the main attack coming on 31 July from Gough's Fifth Army - a little too late as it happens for the momentum had been lost in the interval. It consisted of three phases - the first being the battles for Pilckem Ridge, Gheluvelt Plateau and Langemarck where the Fifth Army pushed its way into a salient made all the more boggy by unseasonal weather and the shelling had badly damaged the land drainage system. Secondly, Second Army took over with the battles for Menin Road Ridge, Polygon Wood and Broodseinde, making good progress in the central sector. Finally, in the battles for Poelcappelle and Passchendaele the attackers, who were by this time exhausted, fought their way onto Passchendaele Ridge in appalling conditions, with the Canadians taking the village on 6 November 1917. The British lost well over 200,000 men, with the Germans losing a similar figure and the battle badly affected the morale of both sides, with the word 'Passchendaele' becoming a byword for suffering. The Battle of Broodseinde, 4 October 1917, was the last of three successful “bite and hold” battles launched by General Herbert Plumer during the middle phase of the Third Battle of Ypres. Both sides were planning an attack on 4 October. When the British bombardment began, it caught a number of German units out in the open preparing for their own attack. The British attack contained divisions from Britain, New Zealand and Australia. As at Menin Road Ridge and Polygon Wood, the British attack achieved its main objectives and then halted to dig in. Although these attacks are normally described as small scale battles, the casualty figures demonstrate the real scale of the fighting. The Germans suffered 10,000 casualties and lost 5,000 prisoners. On the Allied side the Australians suffered 6,432 casualties, the New Zealanders 892 and the British 300. Among these was Percy Sims who fell on 4 October 1917 at the age of just 19. Percy Sims is remembered on the Tyne Cot Memorial, West Vlaanderen, Belgium, Panels 41 to 42 and 163A. His name was added to the War Memorial in the Borough in 2018. Cottages on Reckleford by Goldcroft. Photographed in the early 1960s. These were demolished soon after this photograph was taken. One of them (not sure which) was the home of the Sims family in 1901. The Commonwealth War Graves Commission certificate in memory of Percy Sims.